Indra Nooyi, CEO of PepsiCo, speaking at the World Economic Forum 2010. Pepsi CEO Indra Nooyi (NYSE: PEP) has just released an insightful op-ed about her 123-year-old company's future. Her op-ed, which has gained considerable steam in just 24 hours with 451 shares and over 230 comments, also outlined the myriad changes Nooyi believes needed to happen to compete in a quickly changing market. Nooyi first came up with the "Performance with a Purpose" initiative 10 years ago – before she was CEO – while brainstorming with colleagues about necessary changes that needed to happen at PepsiCo. "People were increasingly looking for healthier foods," Nooyi wrote. "Environmental issues like water scarcity and climate change were threatening ecosystems, livelihoods, and economies around the world. And the competition for the next generation of talent was becoming more intense than ever." So she devised the initiative to focus on these aspects while delivering "strong long-term financial returns." "From the start, we knew this wouldn't be easy," she went on to explain. "We knew it wouldn't happen overnight. We knew it would take a willingness to overcome the doubts of those who said it couldn't or shouldn't be done." 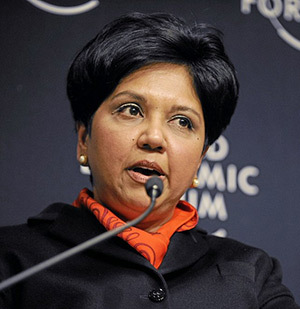 Now 10 years into her journey, Nooyi declared that PepsiCo has, indeed, made important progress. "We're cutting added sugar, salt, and saturated fat levels in many of our products," the CEO explained, "while expanding our lineup of nutritious foods and beverages. Some people are surprised to learn that our beloved Pepsi-Cola trademark accounted for just 12% of our 2015 revenue, while our nutrition brands, low-calorie beverages, and healthier snacks accounted for roughly 45% during the same period." "We're significantly improving our water and our energy efficiency," Nooyi wrote, "reducing our packaging materials and our waste, and promoting sustainable agricultural practices around the world – all of which not only helps protect our planet, but has also saved PepsiCo more than $600 million over the past five years." "We have nearly doubled our net revenue and delivered total shareholder return of 142% – outperforming the S&P 500," Nooyi wrote. "Simply put, we aren't just changing the way we spend money. We're changing the way we make it." Overall, it's a big commitment for the soda company. PepsiCo sells beverages in about 180 countries worldwide and still makes well over $1 billion annually from the sale of its flagship sugar-based Pepsi drink.